A surprising announcement from Genuine Scooter Company today as they’ve taken the wraps off a brand new 400cc motorcycle model. You read that correctly. Genuine is making a motorcycle. In an announcement sent to dealers today, this new model has been dubbed the G400C, and like the Stella before it, this little motorcycle aims to modernize a classic style. Standing for “Genuine 400 Classic”, the G400C won’t wear the Genuine Scooter Company badge. Instead, a new, sibling marque dubbed Genuine Motorcycles will handle this new bike which our sources say is actually the first of several classic-styled motorcycles to wear the big G in the future. The Genuine Motorcycles G400C features a 398cc, 4-valve engine boasting 29 hp, and that’s at the rear wheel, not the crank. Weighing in at just 352 lbs, the G400C is lightweight and compact. Fueling is provided by a Siemens fuel injection system, and a pair of exhaust pipes (one for each exhaust valve) combine into a pair of “pea shooter” silencers. A 5-speed manual transmission helps propel the G400C to a reported top speed of 90 mph. Rounding out the mix of classic and modern, the G400C features both electric and kick start. With the basics out of the way, let’s dig into more of the details. Sources tell us that the G400C is at its foundation actually a Honda-derived engine (think CRF400), transmission and chassis. Earlier in its life, and a continent away, a version of the G400C wore the iconic Honda H. That’s good news for prospective buyers. It doesn’t get more reliable than a Honda single. Genuine has taken that bike and tweaked its details to first modernize it to meet DOT standards, but more importantly to tailor it to an American market of not just entry-level motorcyclists, but scooter owners looking to expand their riding repertoire. The fuel-injection system, provided by Seimens, has been tuned specifically for this bike. So has the exhaust system, which we’re told has an intentional miss-match in length between the two exhaust headers in order to grant the engine a touch of grumbly character. The electrical systems are Taiwanese in origin, which bodes well given Genuine’s experience with PGO and its suppliers. All with Genuine’s standard 2-year warranty and 2-year roadside assistance. For many scooter riders, there comes a time when a small motorcycle starts to feel appealing. That certainly happened to me, and it’s a question we get often here at ScooterFile. Yet finding a motorcycle that appeals to a scooter rider is a bit of a tricky order to fill. They’re experienced riders, but in a different form factor that celebrates small, lightweight machines. If they’d wanted a big motorcycle, they would have bought one already. So any motorcycle that’s going to appeal to scooter owners will have to be just the right mix of capability and approachability. Genuine has tried to thread that needle with the G400C by giving it enough engine to be fully road capable, but keeping things small and light enough that were one to come from riding a Buddy 125, for example, this wouldn’t remotely feel like way too much bike. Yet flipping the coin over, the G400C is enough bike that even for experienced motorcyclists, there’s plenty of fun to be had. Ironically, the G400C would make a great city bike for any motorcyclist who’d never consider a scooter. Strategically speaking, Genuine may have a winner here. The G400C could slot right into an under-represented niche in the market. That is, a small bike that’s easy enough to learn on, but still big enough not to outgrow in the first season of ownership. For both new riders and experience scooter riders alike, Genuine is hoping this machine is just what they’re looking for. The ingredients certainly seem to be there. From Honda quality, to vintage looks, to a whole slew of bolt-on customization options being planned (according to our sources), Genuine haven’t phoned this one in. Sure, it’s a “parts bin” bike, but from what information we have, they’ve been pulling parts from all the right bins. 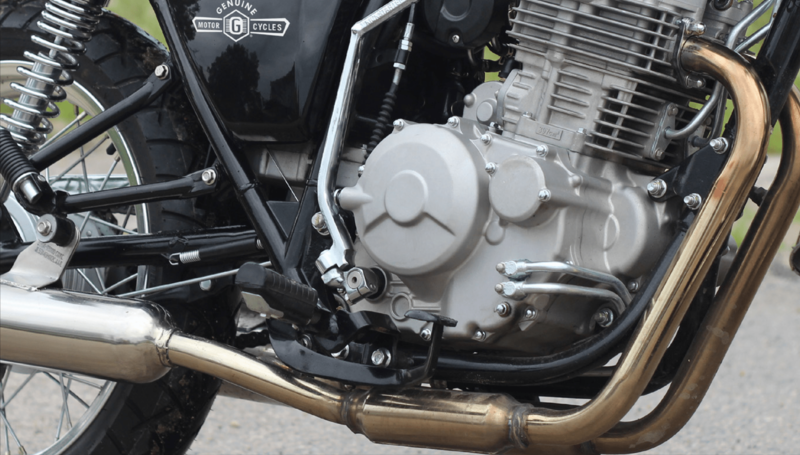 Like with the Hooligan, Genuine have made the transition from simply importing bikes from other markets to using a wide variety of available components to create something they think American riders will love. Time will tell if they’re right. Well, let’s hear it. What do you think? Has Genuine got a winner here, or have they lost their minds? Sound off in the comments. To further fuel the conversation, take a look at the comparison chart they’ve provided. 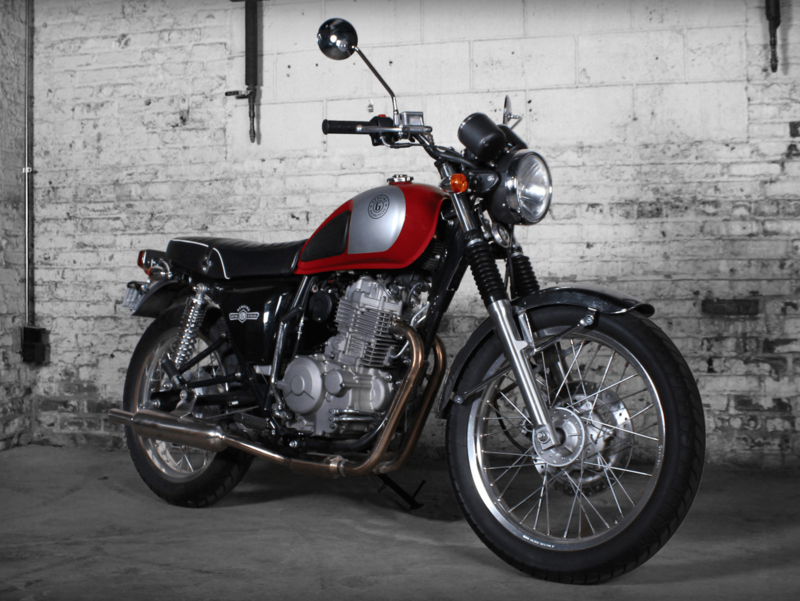 Seeing the Genuine G400C, we can’t help but think of the Honda GB500, which came to the states for just two years. 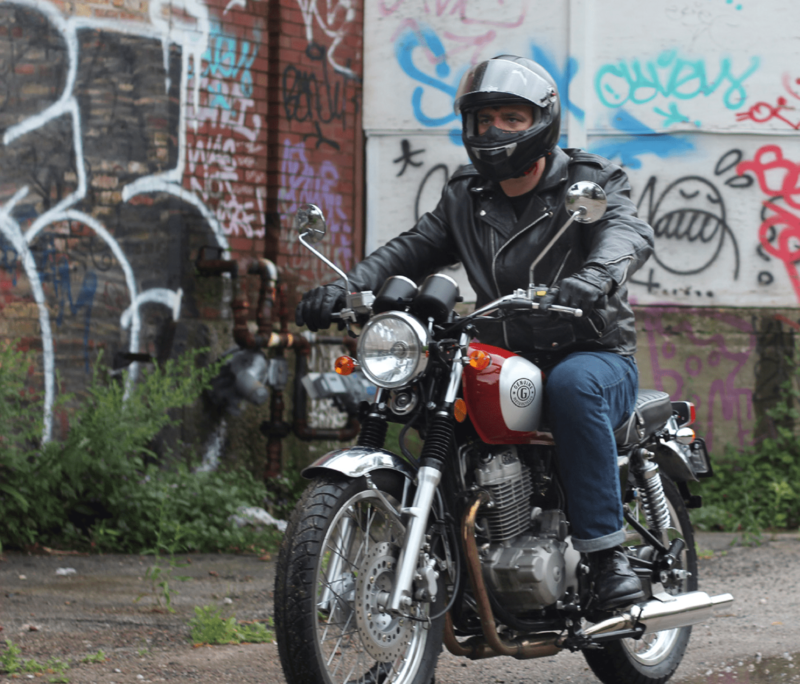 It was way too far ahead of its time to cash in on the “cafe racer” scene, so the GB500 is now a bit of a collector’s item. The Genuine G400C has many of the same ingredients as the ill-fated Honda, but given the success of the Triumph Bonneville and the return of the Yamaha SR400, perhaps this time around the timing is finally right. With Genuine’s engaged community and extensive dealer network, those might be the most important ingredients of all. Are you interested in Genuine's new small motorcycle, the G400C? Before you ask, yes I’ve ridden it. More on that in a later post. Next articlePoll: The Genuine G400C — Love it or Hate it? With just 21 days remaining until Vespa World Days 2013, scooter fans around the world are gearing up for the upcoming event. WVD is held this year in Hasselt, Belgium and promises to be a massive draw for Vespa owners and acolytes of the world’s most recognized scooter brand.